This article is about Joker's appearance in Super Smash Bros. Ultimate. For the character in other contexts, see Joker. Joker (ジョーカー, Joker) is a playable character in Super Smash Bros. Ultimate. He was announced at The Game Awards 2018 on December 6th, 2018 as the second DLC character and is the first downloadable character for the Fighters Pass. He was made available on April 17th, 2019. Joker is classified as fighter #71. 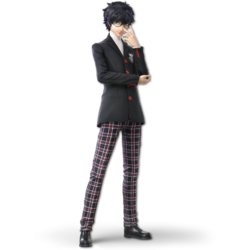 Xander Mobus, who voices Joker in Persona 5 and the announcer, Master Hand, and Crazy Hand in Ultimate, reprises his role as the character in the English version of the game, while Jun Fukuyama, who also voices Roy, reprises his role in Japanese. A dramatic screen effect occurs (if the camera is close enough to the fighters, and the battle is either 1-on-1 or against CPU players only), and Joker removes either his masquerade mask or glasses (depending on his costume), which also alters his character icon in the HUD until the Gauge empties. If Joker is standing still during this, he gains intangibility during the animation. 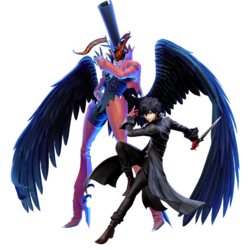 Arsene will attack in tandem with Joker during all attacks except his pummel, throws, floor attacks and edge attack, enhancing his damage output and range. Many of his moves gain an additional blue slash effect while attacking. All of Arsene's attacks use the "heavy melee" hit sounds of heavyweights such as Ganondorf. Joker's special moves change to "Gun Special", "Eigaon", "Wings of Rebellion", and "Tetrakarn/Makarakarn", all enhanced versions of his previous moves. Joker announces "Arsene!" or "Persona!" upon summoning Arsene, and "Return!" upon using up his Gauge. Upon summoning Arsene, the Rebellion Gauge will slowly drain, and a small amount of Gauge will be lost each time Joker is hit. For simplicity, damage values for Joker and Arsene's individual attacks are separated by a slash (/). With Arsene active, the total damage of a move is the sum of both listed values. 2%/0.7% Joker: Performs an inward slash, backhanded stab, then an outward slash. Arsene: Performs an upward swipe, downwards finger point, then a hand thrust. The first two hits can jab lock. 3% (hit 1), 5%/5% (hit 2) Joker: Performs a double thrust with his knife, with the second thrust going at a higher angle. Arsene: Thrusts his right hand forward before raising it in a beckoning gesture. The move can be angled, and both hits are performed with one button press. With Arsene, the second hit is capable of KOing Mario from the edge of Final Destination at around 125%. Useful out of a pivot due to its range. 4% (hit 1), 1%/0.7% (hits 2-4), 1%/3.9% (hit 5) Joker: An upwards swing with his knife that sends it spinning into the air, before Joker catches it backhandedly. Arsene: Raises his hand with a beckoning gesture, emanating electricity from his palm. The initial swing sends opponents into the spinning knife, which deals multiple hits before sending opponents vertically. With Arsene, the looping hits gain an electric effect, and can KO at around 135%. The move cannot hit opponents behind Joker. 6%/7% Joker: A baseball slide. Arsene: A baseball slide alongside Joker. Based off of Joker's ability to slide under lasers in Persona 5. Unlike similar moves like Cloud's and Simon's, Joker's down tilt does not lose strength during the late hitboxes. Easily leads into aerial attacks until high percents. 2% (hit 1), 6%/6% (hit 2) Joker: Performs a roundhouse kick followed by a spinning side kick. This move resembles Zero Suit Samus' forward smash. Arsene: A delayed football kick, which comes out alongside Joker's second kick. With Arsene, the second hit can KO at the edge at around 105%. 14%/8% Joker: Rears back and swings downwards with both hands directly in front of him, similar to Falco's forward smash. Arsene: Swings his arms downwards, causing a X-shaped slash in front of the duo. Moves Joker slightly forward while attacking. Without Arsene, the move KOs at around 76% from the edge of the stage, making it Joker's strongest finisher. However, its range is rather lacking due to the length of Joker's knife. With Arsene, the move gains slightly more range and high KO power, KOing at around 55% from the edge of the stage. 12%/5% Joker: Spins inwards while facing the screen, performing a knife uppercut with his right arm. Arsene: Waves his left arm above himself. Has low horizontal range and a short-lasting hitbox, but covers above Joker, making it a good anti-air. Like up tilt, this move cannot hit enemies behind Joker. With Arsene, the move gains extra range and KO power. KOs at around 130%/100% (without/with Arsene). Resembles the second hit of Joker's standard three hit attack in Persona 5. 12%/6% Joker: Sweeps the floor with a knife swipe in front of himself, then behind. Arsene: Kicks in front, then behind himself, similar to Samus' down smash without a legsweep. Both hits deal the same amount of damage and lack reach, though Arsene boosts its range slightly. KOs at around 112%/73% near the edge (without/with Arsene). Resembles the first hit of Joker's standard three hit attack in Persona 5. 7%/4% Joker: Strikes in a circle while doing two inward corkscrews in the air. The move works much like Shulk's neutral aerial, albeit performed twice and inwards. Arsene: Lays his back against Joker and slashes alongside him, forming a perfect circle slash around the duo. Due to its high amount of active frames and constant damage output, it is a potent edgeguarding tool. While Joker can recover with Grappling Hook even after using it from a full hop fast fall, it is risky to do so unless close to the stage's edge. Additionally, neutral air has a slow startup, and the solo version's hitbox starts from above Joker and stays on his knife, which can cause it to occasionally miss. 2% (hit 1), 5%/8% (hit 2) Joker:A hook kick, followed by a roundhouse kick. Arsene: A delayed roundhouse kick that comes out alongside Joker's second kick. The first kick has low knockback growth and sends opponents lightly upwards, allowing it to initiate aerial combos into aerials or itself; it can even catch air dodges with a smash attack. With Arsene, the second kick becomes a powerful KO move that can KO opponents at 100% from the edge. 9%/7% Joker: An upward swipe behind himself. Arsene: A swift downward chop of his hand, causing the duo's attacks to interlock with each other. Wide hitbox, but lacks reach for both versions. An effective KO move and fast option out of a short hop without Arsene. With Arsene, its hitbox size increases due to Arsene mirroring Joker's attack, and it is capable of KOing at around 110% from the edge. 0.75% (hits 1-4), 3%/7% (hit 5) Joker: A corkscrew flying kick with a finishing kick, similar to Sheik's up aerial. Arsene: A delayed kick upwards in tandem with Joker's last hit. Like Sheik's up aerial, the move's hitboxes are positioned high on Joker's legs, making it difficult to hit small or medium-sized fighters. However, the looping hits use the autolink angle; as a result, it can be used to drag opponents down consistently to extend combos. With Arsene, a full hop up air can KO at around 110%. Seems to resemble Joker spinning in the opening cinematic for Persona 5. 8%/8% Joker: A delayed downward arcing swipe similar to Marth's down aerial. Arsene: A delayed foot stomp that comes out a couple of frames after Joker's attack, instead of at the same time like his other moves. Unlike Joker's attack, it meteor smashes opponents. Because of the different timings of both hits, Joker's slash can knock opponents away from Arsene's meteor smashing kick. However, the kick has more vertical reach. Without Arsene, it cannot meteor smash, but can be used as a combo finisher and potent edgeguard tool, due to its wide arc and semi-spike angle. — Reaches out with one arm. All of Joker's throws have him toss the opponent with a blue energy. 8% Tosses the opponent forward with a flourish of his arm. 10% Trips the opponent over his foot, similar to Marth's back throw. 7% Throws the opponent directly upwards with a flourish. 7% Magically slams the opponent onto the ground while posing and flourishing his left arm, sending the opponent bouncing upwards. An effective combo starter that can combo into aerials. It can also initiate long combo strings of falling up aerial's looping hits into grab. 7% Slashes in front of himself, then behind himself. 7% Slashes behind himself, then in front of himself. 5% Kicks behind himself, then in front of himself. 9% Climbs up and slashes outward. Gun Special: 6%-3%-1% (standard, first bullet), 2%-1.5%-1% (standard, second and third bullets), 4.5% (circling), 4%-1.2% (downward, first bullet), 1.6%-0.8% (downward, second bullet) Fires his gun once with a tap of the special move button. Like with Bayonetta's Bullet Arts, the shots technically are not projectiles, but rather indirect attacks with large disjointed hitboxes. As such, they cannot be reflected or blocked by the shields of all versions of Link. The shots decay in damage and knockback based on the opponent's distance from Joker, dealing no knockback at the furthest distance. The button can be held to fire multiple times; additionally, Joker can dodge between shots by tilting the control stick horizontally, and if he is in midair, either fire in a circle around himself (in a similar fashion to Bayonetta's Bullet Arts up aerial) by tilting up, or below himself in a corkscrewing fashion by tilting down. When Arsene is out, it becomes Gun Special, where it fires three bullets with each shot for the standard version, and two bullets per shot for the aerial downward version. Both Gun and Gun Special have penetrative properties, meaning they can pass through multiple opponents. The closest version of Gun can also lock opponents. Eigaon: 1% (hit 1), 0.5% (hit 2-4), 2.5% (hit 5), 1.5% (gradual damage), 17% (total) A darkness-based projectile that travels at a diagonal angle downwards, similar to PK Fire. It deals little initial damage, but inflicts further damage over time. Each use causes Joker to hover slightly. When Arsene is present, it becomes Eigaon, which travels faster and farther, has an area of effect on hit, hits multiple times, and deals further damage over time. Wings of Rebellion: 0% Shoots out a grappling hook at an upward angle. It functions as a tether recovery, and can grab opponents, dragging them towards Joker and launching them above himself with low ending lag and knockback, making it a reliable combo starter. However, much like Isabelle's Fishing Rod, it can be shielded despite its grab properties. When Arsene is out, it becomes Wings of Rebellion, where Joker flies upwards or at a angle (again depending on input) using Arsene's wings. It has no hitboxes, therefore dealing no damage or knockback, but grants a relatively long period of intangibility on startup. Makarakarn: 1.6× Joker takes a defensive position, during which any direct damage done to him in this state is reduced by 0.4× and builds his Rebellion Gauge. Its period can be extended for at least 1.5 seconds, and if an attack was successfully countered, Joker can perform a darkness-infused backhanded swipe at the end of the move to weakly launch opponents away. When Arsene is out, it becomes Tetrakarn against melee attacks and Makarakarn against projectiles, countering and reflecting them respectively. All-Out Attack 3% (trapping hit), 33.6% (cinematic), 13% (ending screen) Joker rushes forward, trapping opponents. If he misses, Joker can also rush backwards if the control stick is pushed backwards. If any fighter is hit during either of these swipes, they are attacked by Joker and three other Phantom Thieves. (The two possible groups are Ann, Ryuji, and Morgana and Makoto, Haru, and Yusuke.) They then rush at the opponent quickly, with either Futaba or Morgana commenting on the attack. After the barrage is complete, Joker lands in front of the opponent as the screen changes into a splash screen, with Joker in the front gripping his glove, the text "The Show's Over" appearing to the left, and the shadow of the unlucky fighter in the background, spewing sparkles. Causes an instant KO if the opponent is above 115% when the cinematic is over. If the Final Smash's possible resulting KO is the final KO needed to win, the splash screen will remain throughout the victory screen. Drops from the top of the screen, then adjusts a sleeve like in his up taunt. Morgana appears for each of Joker's taunts. If he is present, Arsene will also rear back and flourish with his left arm when Joker taunts. Smiles and tugs his sleeve while facing towards the camera. Morgana pumps his paw while saying "Looking cool, Joker! ", before posing akimbo. Poses with his gun pointed, gun arm over his dagger arm. Morgana poses akimbo and meows playfully while showing starry eyes. Faces his back towards the camera. Morgana goes "He-hey!" while bouncing on the spot, before crossing his arms. If Joker is involved in a fight with more than four fighters, Morgana won't appear during his taunts. Twirls his knife towards his chest. Twirls his gun before posing. Note: If there are three or more players, the color scheme will match the player's port. If Joker wins on Mementos, the color of the victory screen will match the color of the stage, and the victory music will be replaced with the corresponding victory fanfare from the game Mementos' design is currently derived from. In all three of his victory poses, the transition to the victory screen will showcase a puff of cartoony smoke with star decals, and ending screen will always result in Joker moving continuously to the left, replicating the victory screen from Persona 5. Upon accessing the results screen, Joker will say "Be gone. ", "Nice. ", or "Hah!" Morgana bounces happily around Joker. Joker gestures to the bouncing Morgana before running towards the left. Morgana glares at the bottom right of the screen, which ends up hitting him in the face, causing him to spin around. Joker gestures to Morgana before running towards the left. Joker scratches his head as Morgana, transformed as the Morgana Bus, drives up next to Joker, picks him up, and drives towards the left. 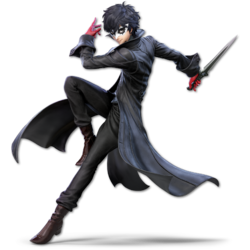 If Joker is in a Team Battle and someone else poses in front, he will perform an exclusive animation where he tightens his glove and maintains a stance similar with his knife, although both of these are ported directly from his in-game up taunt and idle animation respectively. If Joker wins a Stock or Stamina match with All-Out Attack, the match will conclude on the splash screen without returning to gameplay, and this will persist into the victory screen, just like in Persona 5. Joker's default victory theme, ripped directly from the battle results screen of Persona 5. Joker's victory theme after winning in the Persona 4 version of Mementos, ripped directly from the battle results screen of Persona 4. Joker's victory theme after winning in the Persona 3 version of Mementos, ripped directly from the battle results screen of Persona 3. When transitioning to the results screen, one of the Phantom Thieves will say one of the following quotes in place of the announcer's usual "[character] wins!" Morgana Smash is as wild as ever, eh Joker? Ann Takamaki Feels great, huh? Yusuke Kitagawa And the curtain... falls. Well... Onto the next triumph! Makoto Niijima No time to waste! Futaba Sakura Heh heh heh! They're done for! Haru Okumura That was graceful! Joker mainly fights opponents relating to shadows. On every round, the former enemy fighter becomes a ally to him under a new Alternate Costume, referencing how in Persona 5, Joker can negotiate with the Shadows and recruit them as Personas, freeing the corrupted demon in the process. Additionally, some items and Assist Trophies are references to Persona 5, such as the Kapp'n Assist Trophy referencing the Morgana Bus. The final boss is an homage to the god Yaldabaoth, the final boss of Persona 5, with the final boss theme Our Beginning also present. 2 Giant Kirby Kalos Pokémon League Aria of the Soul Mr. Game & Watch is a CPU ally. 3 Samus and Dark Samus Mementos Mass Destruction Kirby is a CPU ally. 4 Meta Knight Mementos (Battlefield form) Beneath The Mask Dark Samus is a CPU ally. 5 Link , Toon Link and Young Link Mementos Reach Out to the Truth Meta Knight is a CPU ally. 6 Giant Incineroar Mementos (Ω Form) Rivers in the Desert Link is a CPU ally. Final Master Hand Mementos (Ω Form) Our Beginning On Intensity 7.0 or higher, Crazy Hand joins the fight alongside Master Hand. Due to his status as downloadable content, Joker does not have a legitimate role in World of Light. Instead, he is unlocked for use in the mode after freeing 20 fighters from Galeem's control. If loading an existing save file that meets this condition prior to downloading Joker, he is immediately unlocked. Joker There is no fighter battle for Joker, this fighter is obtained by awakening 20 fighters after he is downloaded. Joker's Fighter Spirits can be obtained by completing Classic Mode. They are also available periodically for purchase in the shop for 500 coins, only after Joker himself is downloaded. Unlocking Joker in World of Light allows the player to preview the first spirit below in the Spirit List under the name "???". As Fighter Spirits, they cannot be used in Spirit Battles and are purely aesthetic. Each Fighter Spirit has an alternate version that replaces them with their artwork in Ultimate. 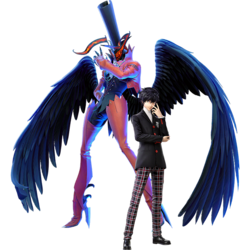 Arsene also makes an appearance in Joker's Fighter Spirits, having a unique render when shown with Joker's Ultimate artwork. Because of this, Joker's Ultimate renders in his Fighter Spirits will show him without his mask/glasses on. Additionally, he appears in the Phantom Thieves of Hearts Spirit. Trailer on the Super Smash Bros. Ultimate website. Version that played at The Game Awards 2018. Proper gameplay reveal, titled "The Masked Rebel". Joker artwork, as posted on the official Japanese Persona Twitter account by Shigenori Soejima. A tease of Joker's model from the February 13th, 2019 Nintendo Direct. A view of Joker's in-game model from behind. Joker wielding his gun on Moray Towers. Joker attacking with Arsene on Mementos. Joker with Morgana on Skyloft. Joker posing with Arsene on Spear Pillar. Joker in his school outfit with Inkling and Isabelle on Delfino Plaza. Joker is the first selectable character in the series to share their voice actor with the announcer in the English version of the game, barring Master Hand's playable appearances, as Master Hand is not a normally selectable character outside of these circumstances. Joker and Inkling are the only newcomers in Ultimate to be announced without any gameplay footage in their first reveal trailer. Joker has three reveal trailers (counting the separate versions as different trailers), and is the only character with this distinction: one was played during The Game Awards 2018, and one was officially posted online afterwards, which removes dialogue references to The Game Awards. The final one was posted online as well. Out of all the character reveals in both Smash 4 and Ultimate, Joker is the only character to be revealed at/in a non-Nintendo event/video. The invitation is depicted as being enclosed in an envelope with a wax seal in the shape of the Super Smash Bros. logo. This is a callback to previous character reveal trailers for Villager in Smash 4 and Isabelle in Ultimate. An instrumental arrangement of Life Will Change plays fittingly during the reveal, as the song plays while the Phantom Thieves are infiltrating a Palace to steal a treasure after sending out a calling card. After Sonic and Bayonetta, Joker is the third guest fighter to represent Sega, as Atlus was acquired by Sega Sammy Holdings in 2013. Joker is the second character to have his victory theme directly ripped from a non-Smash game, the first being Sonic. He is also the second character whose victory theme plays continuously rather than playing the results theme afterwords, with the first being Cloud. Joker had his render leaked on March 31st, 2019, by Best Buy before his official render was revealed. Joker is the only character so far whose character render changes under certain circumstances, as his mask (or glasses, in his alternate costume) will be removed when Arsene is present. Joker is the only character so far who utilizes a knife in his standard moveset. Joker is the only character with the distinction of having more than one victory theme in one game. Joker's Classic Mode can be considered an antithesis of Mewtwo's. Both characters "recruit" the opponent they defeated on the previous round; however, Mewtwo's partners are turned into "corrupted" alternate costumes, while Joker's allies now have light alternate costumes to represent that they were "purified". Joker and Donkey Kong's Classic Mode routes are the only time in the Super Smash Bros. series where Master Hand is not fought on the respective game's Final Destination, not counting the Master Hand glitch in Super Smash Bros. Melee. Joker is the second character in the whole series to have fewer than three solo victory poses, the first being Kirby in Smash 64. However, Morgana has three victory poses, the background color has alternate options depending on the background song's origin game, and if All-Out Attack takes the last KO, it will cut straight to the victory screen. In a way, Joker also has more than three victory options. He is also the first character who doesn't have the announcer say his name on the victory screen. Instead, the announcer's line is replaced by a comment from one of the Phantom Thieves. He is also the only Fighter to have a victory pose reserved for Team Battles only. Joker is one of the six characters to use their default outfit in Spirit Battles, the other five being Mr. Game & Watch, Bowser Jr., Yoshi, Inkling and Robin, though like Inkling and Robin, this only applies to DLC Spirits. Joker is currently the only fighter with no character showcase trailer. Joker is the third character with the ability to counter attacks and to reflect projectiles in his default moveset, the first two being Palutena and King K. Rool, respectively. Joker is one of the few characters to speak during a KO: his alternate KO line has him saying "What?!". This page was last edited on April 22, 2019, at 15:48.